Days of the Week in Spanish. Monday in Spanish through Sunday! How do you say the days of the week in Spanish? Learn it here! Grab your Spanish Weekdays free lesson. pronounced pretty much as it is written! Now you must say these a whole bunch of times. Chant them ten times each, in the morning, before each meal, and before you go to bed each day. Do this every day for a week. Put it into a song. Sing it, chant it, rhythmn it, rap it. Whatever beat spins your wheel. And keep repeating it. This way through repetition you will drum it in to your memory. ... by using the techniques that the world memory masters teach. These are the sorts of people that can memorise twenty, thirty or even decks of shuffled cards. Basically they say that the longer-lasting way to memorize words is to visualise them in a crazy, wacky, off-the-wall, goofy, silly, zany scene! Which basically anyone can do. 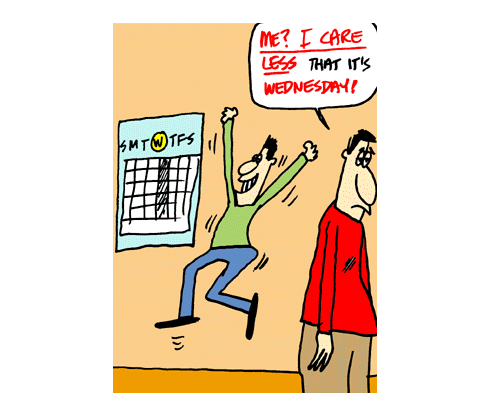 "ME, I CARE LESS that it is Wednesday." To make it even easier for you we have put in a picture... to save your brain-power those few moments of effort to stop and think. This makes memorising Spanish words really easy. To learn more click on the link. Learn the days of the week in Spanish, the 200 Words a Day! way. Copyright©. All rights reserved. Images 200 Words a Day!© Exceltra.